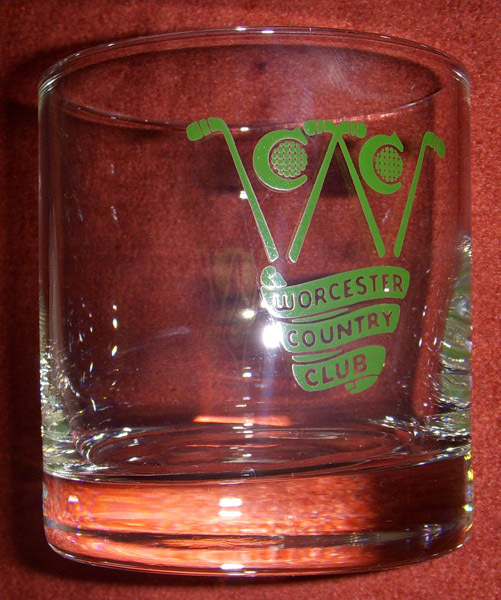 ARTIFACT: This is a great classic circa 1930s or 1940s "old-fashioned" or "lowball" cocktail glass for the Worcester Country Club in Worcester, Massachusetts, founded in 1900. The main part of the green logo on the front of the glass is a W shaped from hockey sticks. SIZE: Approximately 3-1/8� in height and 2-7/8� in diameter. CONDITION: 8 (Excellent-): The glass shows little wear.